« What is Co-Editing, Anyway? I’m a PC. And a Mac. And a Linux. Autodesk’s Project Butterfly makes it possible for Mac users to edit CAD drawings for the first time. What was until recently an uncharted territory is now publicly available, and for free. In short, Project Butterfly from Autodesk is a Web-based application that enables CAD editing without any installation or download of any kind. Apart from web access, Project Butterfly has features that accelerate the design process by allowing multiple users to work on the same drawing simultaneously or separately. Read more in our first post. Because Project Butterfly is Web-based, it can run on Mac and Linux just as it does on a PC, the traditional platform for CAD editing. Project Butterfly can also run on every browser, as long as it has Adobe Flash installed. Are you a designer with a desktop PC but travel with a Macbook? Are you a professional but your clients have Macs? If one of the above applies to you, then try Project Butterfly. Sr. Product Manager, Project Butterfly. This entry was written by Butterfly, posted on January 25, 2010 at 3:19 AM, filed under News. Bookmark the permalink. Follow any comments here with the RSS feed for this post. Post a comment or leave a trackback: Trackback URL. But you’re not an iPhone or iPad… Will Flash 10.1 fix this or can’t you get it to work without Flash & use HTML5? We don’t require HTML5 to run Project Butterfly, only Flash 9 or 10 installed (you should have that on your desktop/laptop anyway). Can you contact me at feedback@autodeskbutterfly.com? I would like to help you with this problem. It is supposed to function. Like the previous poster, I also had difficulty using Butterfly, and (perhaps coincidentally) I’m also running Linux. The environment is Google Chrome version 4.0.249.43, and an updated installation of Ubuntu 9.10. I visited the main page for Project Butterfly ( http://labs.autodesk.com/technologies/butterfly/ ) and hit the “Try it now” button (no sign-in, “Try now”, Architectural items). A drawing-like screen appeared, and a loading progress bar started at 0%, but then it didn’t move from 0%, even after about 30 minutes of waiting. I tried re-installing Adobe Flash for Linux, version 10.0.42.34, exited the tab which was on the butterfly page, started a new tab, and went back to the “Try it now” button (same options as before). Once again a screen came up which looks like a drawing editor, and a progress bar appeared near the bottom, starting at 0%. Then the progress bar moved to 1%. Progress! After about 30 minutes of waiting, however, the progress bar is still at 1%. Oh, well. I don’t often edit AutoCAD drawings, I just wanted to see how Autodesk is handling the ever-growing demand for doing CAD on a web browser (in particular, how you handle complex dimensions). I can still get a pretty good idea of how it works from watching YouTube videos and other documentation, so I don’t intend to try out Butterfly again. I’m passing along this bug report simply to help out some fellow programmers with what looks like an excellent project. If you want to try fixing this anyway, and have difficulty recreating the bug, feel free to contact me. “…possible for Mac users to edit CAD drawings for the first time”. Mac users have never before been able to edit CAD drawings? You’re joking, right? I saw ’em doing it over 20 years ago. Be careful making claims like that, it doesn’t reflect well on you or Autodesk. 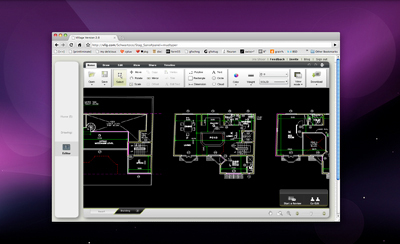 My intention was that this is the first tool that uses the AutoCAD engine to edit native Autodesk DWG files on a Mac. Yes, there are other tools that edit CAD on Macs, but none of them incorporates original Autodesk technology in them. You know there was once a native AutoCAD for Mac, right? It needs flash? You know only one developer is doing flash plugin for linux? I was not aware of that. I had Flash installed on my Linux netbook, so it seems pretty basic for me. This is very interesting for Mac and Linux users, since there are other programs to be edited and CAD, but have a good integration with AutoCAD. I wonder if this project will remain free and will pay in the near future. I also wonder whether more tools implemented as shading and layering. This project will be free at least in the next 6 months, so no worries there. And if we do become a paid service, you’ll still be able to access your files and get them. Yes, we are developing new tools all the time. Only today we implemented some new ways to edit arcs, and the use of more snapping points throughout the entire app. Layering is our next challenge now. Thanks for your input and compliments! Thanks for your quick response, I wish to remain a free tool. I also wonder if implemented using orthophotos and tools in AutoCAD Map. Gargon, we’re collecting all feedback from users, and we are thinking about your suggestions as well. The Project Butterfly is promising and I am really excited about the fact that it is usable on multi-platforms.